The Manchester Warehousemen and Clerks' Orphan Schools were opened in 1855, two years after the founding of a similar charity in London. In September, 1854, a representative of the London establishment visited Manchester to discuss with a group of local businessmen the idea of setting up a similar institution in the city. 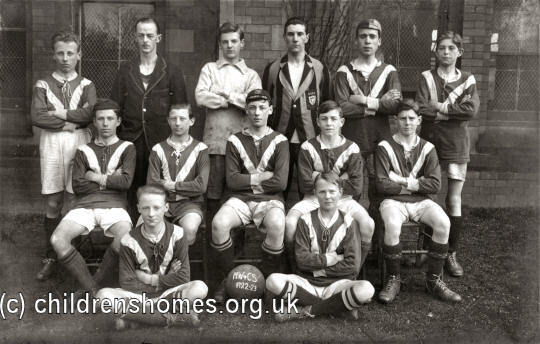 A committee was formed to pursue the scheme which was to be known as the Manchester District Schools for Orphans and Necessitous Children of Warehousemen and Clerks. The raising of donations and subscriptions then began. An inaugural meeting of the charity's subscribers took place on February 26th, 1855. It was decided that the school would be solely for the orphans and necessitous children of warehousemen and clerks and that it would be non-denominational. Children would be admitted only between the ages of seven and twelve years; boys would leave at the age of 14 and girls at 15. On October 29th, the first six entrants to the school were selected, as was usually the case in such institutions, by a ballot of the subscribers. 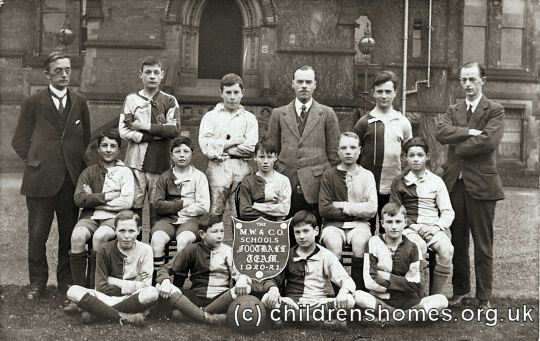 The children were initially placed at a boarding school run by Mr Macdougal at Shaw Hall, Flixton. In 1861, the charity opened its own premises at Park Place, Ardwick. Increasing numbers at the home led to plans for a large purpose-built home on Claremont Road, Cheadle Hulme. The foundation stone of the new building was laid by Earl Granville on 28th August, 1867, with the children taking up residence two years afterwards. 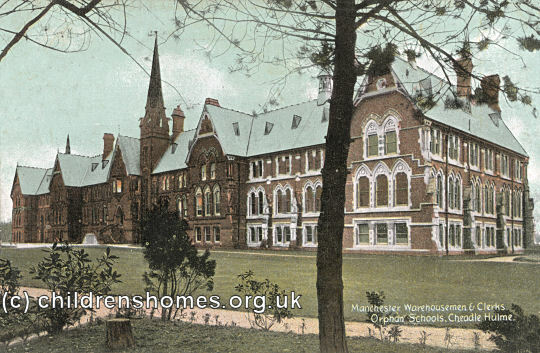 The three-storey building, accommodating 60 boys and 40 girls, was designed by Ernest Bates of Manchester. It was 188 feet long, with wings and gables at each end. A central gable with tower and spire rose to a height of 120 feet. A central flight of steps led to the large entrance hall. The girls half of the building, to the right, included the matron's room, mistress's room and classroom. In the wing beyond was the schoolroom, 52 feet in length by 22 feet wide. To the left of entrance hall were the visitors' committee room, classroom, and boys' school. Immediately beyond the entrance hall was the dining room, 40 feet by 24 feet. Separate staircases led from the boys' and girls' rooms to the dormitories above. Beneath the main entrance and dining room was the kitchen department, consisting of a larder, kitchen, scullery, bread room, wash-house and laundry. Under the girls' wing were the servants' hall, boot room, lavatory, and a play-room for use in wet weather. The boys' side was similar except for matron's stores replacing the servants' hall. On the first floor were the dormitories, with the master's bedroom placed in the centre above the entrance hall. 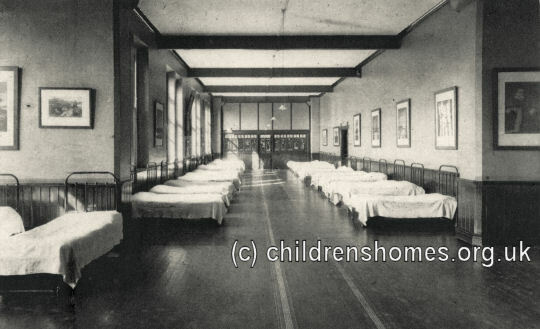 The boys' had two dormitories, one 44 feet by 21 feet, and the other 52 feet by 22 feet, with lavatories and bath-room placed between them. On the girls' side were the matron's bedroom, the mistress's bedroom, and the girls' dormitory, 52 feet by 22 feet with lavatories and bath-room attached. Behind these was a corridor, extending the whole length of the building. 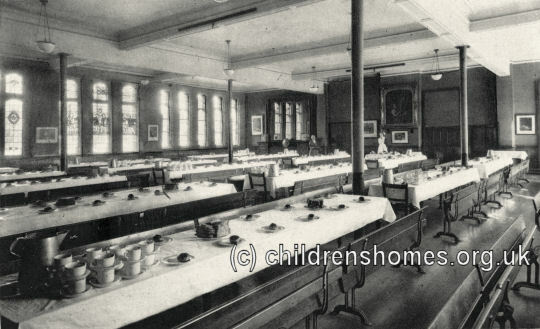 Above the kitchen department were the linen rooms, and the infirmary for the sick children. The assistant master's bedroom and the assistant mistress's bedroom were placed respectively in the boys' and girls' dormitories, to allow supervision of the children during the night. The servants' rooms were placed in the attic. There was a hoist from the kitchen to the dining-room, to convey the food and other articles to the children without the servants needing to run up and down the stairs. The building was constructed of bricks, made on site, and Darleydale stone dressings, with bands of blue bricks. Its total cost was around £10,000. The location and layout of the home is shown on the 1898 map below. 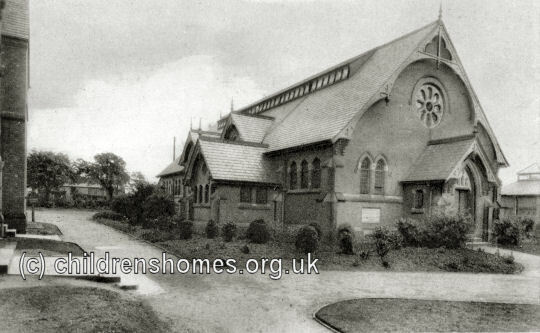 Manchester Warehousemen and Clerks' Orphan Schools site, Cheadle Hulme, c.1898. From 1862, in order to help finance its support of orphans (known as 'foundationers'), the school began taking fee-paying boarders and day pupils. Additions to the buildings and facilities continued over the years. A new block known as Holden Hall was erected in 1882 to provide new classrooms. Extensions to the outer wings were made in 1899 and 1903. 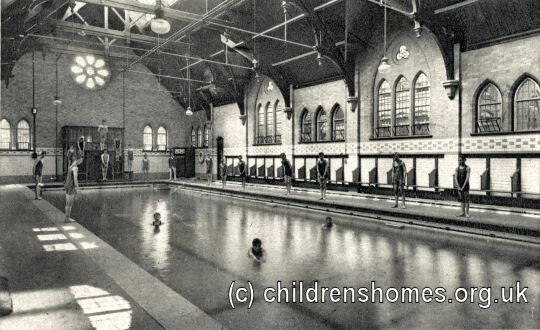 A swimming pool was built in 1911. During the First World War, the school's infirmary became a Red Cross hospital with more than 1400 injured soldiers being treated. 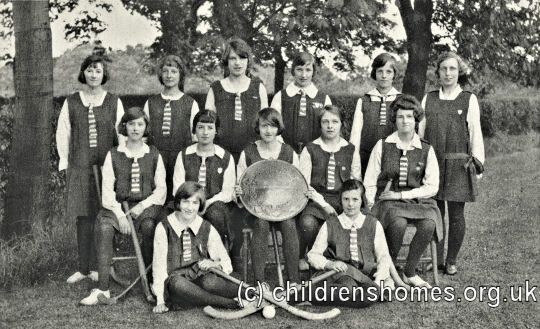 During the Second World War, pupils from the Manchester High School for Girls and Fairfield High School were evacuated to the school. 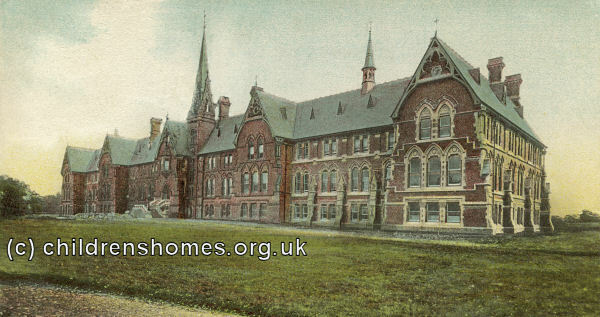 From 1948, the school gained the status of a direct-grant grammar school, then became independent as Cheadle Hulme School in 1976. Cheadle Hulme School still holds the institution's extensive historical archives which include: Admission registers (1855 onwards), Birth/Marriage/Death certificates (late Victorian period), Annual reports (1854 onwards), Minute books (1854 onwards), Photographs (1870s onwards), Diaries, School magazines, Scrapbooks, Film etc.